Valet parking ​and self parking are​ complimentary courtesy of Kia Motors America. Century Boulevard to 405 North. Take 405 North to Wilshire Blvd East exit. Go East on Wilshire 2 miles. 405 South to Wilshire Blvd East exit. Go East on Wilshire approximately 2 miles. 10 West to Robertson Blvd Exit. Go right to Wilshire Blvd. Take Wilshire West 1 mile. 10 East to 405 North. Take Wilshire Blvd East exit. Go east on Wilshire approximately 2 miles. Distance from hotel: 10 mi. Drive time: 30 min. 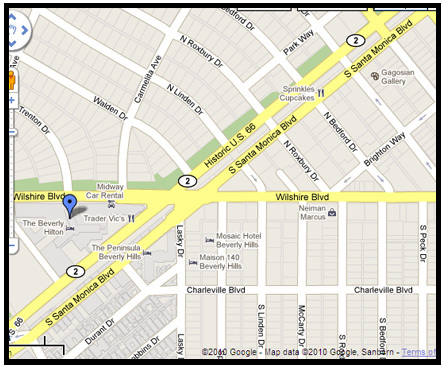 Directions: Departing the airport, take the 405 North to the Santa Monica Blvd exit. Turn right and continue for 2.5 miles. Distance from hotel: 50 mi. Drive time: 1 hr. Directions: Take the 405 North to the Santa Monica Blvd exit. Turn right. Drive 3 miles. Distance from hotel: 17 mi. Drive time: 45 min. Directions: Turn right onto Hollywood Way from airport to Alemeda. Turn right and immediately onto the 134 Freeway entrance. This turns into 101. Proceed South on 405 to Wilshire Blvd exit East. Drive for 2.5 miles.